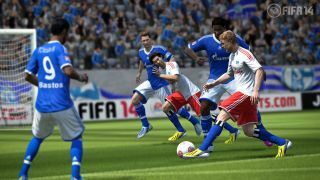 When TechRadar last took a look at the latest tech behind FIFA 14 it was very much at the hands-off stage and for all the impressive new ball mechanics theory we really wanted to know what it felt like in the game. So when EA invited us back to its Guildford offices we jumped at the chance to see just how much difference the mechanics that include things like shielding the ball, skills without a trigger press and momentum make to gameplay. EA Sports producers Kantcho Dosckove and Sebastian Enrique were on hand to talk us through the previously outlined changes and a few additional ones, including the major changes to player momentum. The latter addition is a key one, people familiar with FIFA 13 will immediately notice that the way that your players move and, more importantly, change direction is massively different. In fact, we'd go as far as to say that the first few plays will make you feel like your players are clumsy, difficult to control and cumbersome. Make no mistake about it, for those that objected to the defensive changes that arrived last year this is going to be another big adjustment. The build that we played was pre-alpha (around 60 per cent complete according to Enrique) so we're sure some majoring tinkering will go on between now and release, but as your previously nimble central midfielders drift up to speed you may be mistaken in wondering if you are playing with Accrington Stanley rather than Arsenal while you adjust. It's going to be divisive and we have no doubt that for some it will be a major point of criticism: it certainly entirely changes the game and the way you will play it. The key thing here is that, as much as we loved FIFA 13, it was a game in a series that needed some fundamental alterations if it wanted to progres, and it's not just brave but entirely necessary for EA Sports to make changes. Proper momentum, alongside the new shielding mechanism, unlocks huge potential for variety that previously didn't feel like it existed previously. As we suggested when we saw the original demos, the focus on pace is much reduced and that is a game-changer in the best possible way. Previously, a player that lacked pace became nigh-on pointless even if they were physically and mentally strong. Pace should be important in any simulation of the modern game, but it shouldn't mean that it overshadows every other ability to the degree it does in FIFA 13. It's important that EA has recognised this, and whether you love the way a player's weight shifts, or his strength dictates how he holds a defender off or jostles for position, what the changes bring most significantly is huge potential for different types of playing style. Suddenly big centre forwards without pace are another meaningful option - playing the ball into feet and feeding off them or letting them hold nippy defenders at bay to work space for a powerful shot. It's, in truth, not absolutely there yet - someone generally very well-rounded like Steven Gerrard felt overpowered, and the momentum has 'nerfed' pacey but lightweight players a little too heavily at the current time - but we expect this to be tweaked extensively by launch. The stated aim for FIFA 14 is to make scoring goals feel special and, again with some provisos, the changes to things like shooting look set to tick this particular box. The improved ball physics and the way in which a player adjusts his stride to strike a ball make a spectacular drive into the top corner feel just that - spectacular. The AI of the computer does need a little more work though. The momentum of the players doesn't always feel like it has been factored fully in to the computer's play and that leads to some irritating and occasionally comedic flaws. Overall our feeling is, certainly at this point, the new tech in FIFA 14 has fundamentally altered the game and brought a whole new dimension to the play. Goals are more satisfying and players feel more individual - two additions that are massively welcome. We're hoping that EA use the coming months to continue down this encouraging path, and that the 40 per cent that needs to be completed includes better balancing of the gameplay and player types. Fundamental gameplay changes to a familiar title are always a little scary and, at first, difficult to accept - but it feels like these are necessary changes to take the Fifa games to a whole new level, and who doesn't want more variety and personality in their games?